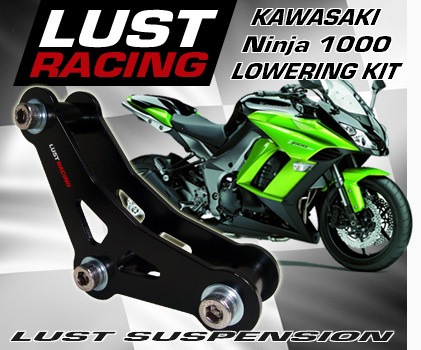 Lowering kit for Kawasaki Ninja 1000 models by LUST Racing. Lowers the rear suspension by replacement of the pivot-arms in the rear suspension linkage. By lowering the rear suspension the seat height is reduced. High quality lowering kit made in roll forged steel stronger than the standard parts replaced. Lowers the rear suspension by 30mm / 1.2"inches. Perfect fit. Finished in corrosion resistant powder coating, color black with LUST Racing logo in red and silver-chrome. Supplied with installation instructions. Select correct kit for correct year model. simple bolt-on installation. Installs between sidestand bracket and frame. Adds 5 degrees lean angle to the bike.